Google has added a range of updates to its Chrome OS and accompanying Chromebook PCs that are designed to make it even more central to your workplace. The announcements, which were made at the first Chrome Live event, include the addition of Box as the first external service to integrate itself with Chromebook laptops and it lets users of the cloud storage service access files in the same way as Google Drive users can, according to PC World. Secondly it has made its video-conferencing offering, Chromebox for Meetings, more expansive by adding the chance for larger group sizes to be catered for. This means that pan-tilt cameras situated in larger conference rooms will soon be supported and to this end it is working with Dell, HP and Acer. 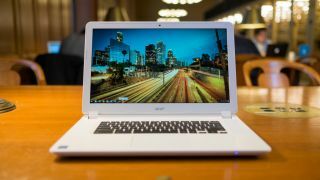 The third wish it has granted customers is to make it easier to complete a single dedicated task on a Chromebook. All three updates are part of Google's Chrome for Work offering that aims to bring companies over to Chrome OS devices by championing a cross platform approach. Rajen Sheth, director of product management for Android and Chrome for Work, added that most workplace applications are now mobile of web-based instead of Windows apps, although he failed to back this up with any figures. One of the major advantages of Chrome devices, according to Sheth, is that firms won't need to replace existing hardware and software products to use Chrome devices and services. The likes of Netflix and Pinterest are already using its Chrome's office tools and that shift could well hasten in the coming months.